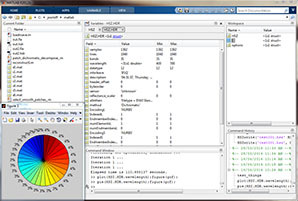 Scyllarus is comprised of three parts – the Hyperspectral visualisation and analysis tool ‘Scyven‘, the MATLAB® Toolbox, and the C++ API. The software contains code based on several years of research within Data61 and opens up a wide range of possibilities for all sorts of users. 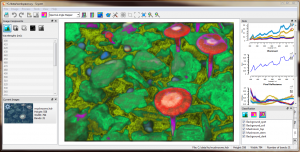 Scyven (Scyllarus Visualisation Environment) allows you to inspect Hyperspectral images, and analyse images to discover the spectral signatures that are present within the image. With one click, you can view an image’s material breakdown. For example, Scyven can show you what parts of an image are leaves, and further analysis could determine the condition of those leaves. 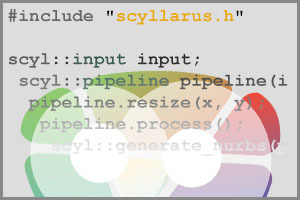 The Scyllarus C++ API is available to developers looking to integrate highly optimised and state of the art Hyperspectral image processing into your own application. If you want to see some of the things the Scyllarus C++ API can do, check out Scyven, it’s powered by it! Armadillo and OpenMP under the hood for optimised image processing. Several powerful Hyperspectral image processing and analysis features including Illuminant Recovery, NURBS Encoding, and Material Clustering.